If you have a collection of DVDs, two or more mobile devices, and a Mac, you probably find yourself needing to convert DVD on Mac. You can digitize DVDs on Mac for playing on your iPhone, iPad, Android phones tables, or for uploading to NAS, Cloud, Media Server, or for transferring to USB, hard drive, or simply for storing and organizing on Mac computer. There are a lot of Mac DVD converter programs out there, but the result varies from one application to another. We pick out the best three from them, MacX DVD Ripper Pro, Handbrake and VLC , and walk you through how to convert movies on DVDs free on Mac with nice quality. An all-around DVD converter for Mac offers more support options. MacX DVD Ripper Pro is one of the best top-rated programs. With rebuilt DVD title check mechanism and analysis algorithm, the program supports to convert every and any DVD, including 99-title DVDs, TV series on DVDs, workout/exercise DVDs, damaged/unplayable DVDs, Japanese DVDs, new DVD releases, and many other DVDs free open source DVD converting software for Mac like Handbrake can't convert. * It can digitize DVDs on Mac to MP4, AVI, MOV, WMV, MKV, FLV, MTS, etc. with 350+ preset profiles for playback on VLC, QuickTime, iPhone, iPad, TV, or storing on NAS, hard drive, or uploading to Cloud, media server etc. * The support for hardware acceleration VideoToolBox makes it the fastest DVD tool - process a DVD on Mac in five minutes! The DVD conversion speed also depends on your Mac computer performance. * High Quality Engine makes it possible to deliver nearly original quality output and optimized music DVD conversion tech guarantees lossless direct copy with excellent DTS/Dolby audio quality. The multipurpose best DVD ripper for Mac is also very simple to use, just insert DVD, choose output profile, click "RUN" and done. Free download the DVD converter for macOS (macOS High Sierra also supported), run it, and follow the detailed guide below to learn how to free convert DVD on Mac. Step 1: Click "DVD Disc" to load DVD disc, or VIDEO_TS folder, or ISO image. 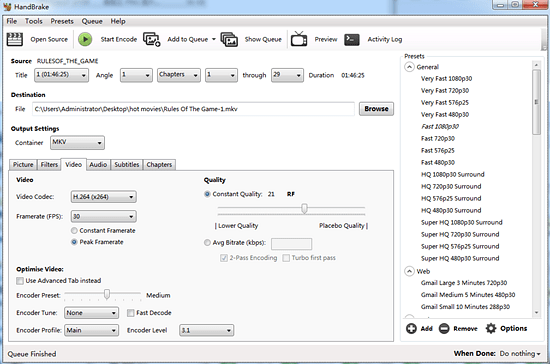 After the DVD is loaded, Output Profile window will pop up. 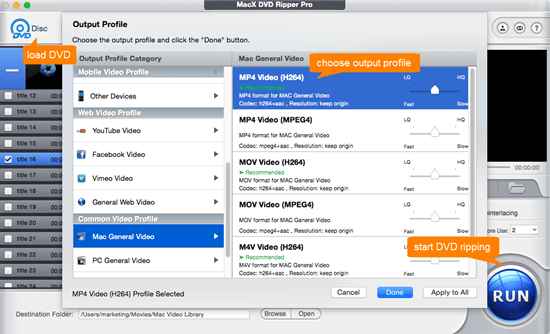 Step 2: On the Output Profile window, Head to Common Video Profile > Mac General Video and you can choose to convert DVD to MP4, MOV, M4V on Mac. Step 3: Click "RUN" and start to fast transcode DVD disc on Mac without losing quality. There're lots of open source free DVD copy software that helps free convert DVD Mac. Handbrake is the most popular open source free DVD converter for Mac. It can convert homemade DVDs and some encrypted DVDs with third party help libdvdcss. Output quality is good and file size is not large. Handbrake is simple to use to turn DVD discs to MP4 video format on Mac if you don't need to do Handbrake settings. Follow the guide below to free convert DVD on Mac with free open source DVD converter for macOS. Before you go, download the freeware and run it on your computer. Outputs: MP4 and MKV file format. MPEG-4, H.264, Theora video, AAC, MP3, Vorbis audio. Step 1: Click "File" icon on the upper left corner, and click "Folder" to open a VIDEO_TS folder etc. Or click "Open Source" to load DVD disc you've insert to hard drive. Learn how to fix Handbrake won't scan DVD if your DVD won't load with the free DVD converter for Mac. If your DVD is encrypted, download and install Handbrake libdvdcss. Step 2: Click "Container" under Output Settings, and select a format as output from the drop-down menu. Step 3: Do Handbrake settings. You can just leave default settings selected as improper settings may lead to scrambled, choppy or broken up video from DVD. Step 4: Click "Start Encode" to let Handbrake rip DVD for free on Mac. Some multifunctional media players like VLC can be used to rip DVD on Mac free. If you use VLC quite often to play DVD, you can try VLC to free convert DVD you buy or rip Redbox DVD you rent on MacBook Air Pro/iMac. VLC can run on 64bit Intel-based Mac (Mac OS X 10.16 or later). But VLC only supports to convert noncommercial DVD disc to Mac. After all, DVD to digital format ripping is not the main function of VLC, it always pops up error message telling that input cannot be opened, VLC crashes during free DVD conversion on Mac. It may take some time to learn how to free digitize DVD on Mac with VLC. Step 1: Run VLC media player if you have downloaded it on Mac. Click Media > Open Disc, and Click "Browse" to select a DVD to load. Step 2: Click "Play" and choose "Convert" from the drop-down menu. And VLC will give options to select output profile on the "Convert" window. Step 3: Select output profile. VLC enables users to free convert DVD on Mac to H.264, H.265, MPEG-2, Theora, WMV, TS with MP3 audio or Vorbis (OGG) audio. Step 4: Click "Start" and begin to transfer DVD to MP4 on Mac, or to WMV, TS etc. digital video format with VLC media player. Note: We only call for converting commercial DVDs on Mac under the concept of Fair Use and we don't encourage any illegal reproduction or distribution of copyrighted content. Please abide by the local DVD copyright law before doing it. MacX DVD Ripper Pro, the best DVD converter for macOS can free convert DVD on Mac for storing onto hard drive, media server, nas, USB, or for playback on mobile devices with at least 5x faster speed than other free DVD converters for Mac like Handbrake, yet without quality loss.